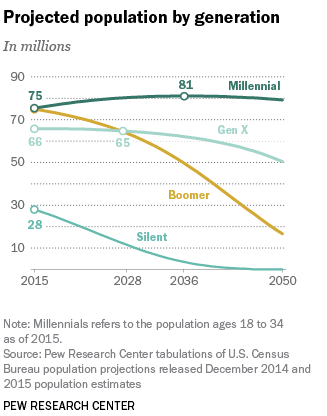 More Millennials than Baby Boomers … bad news for capitalism. Let’s connect a couple of dots today. That’s right, Millennials (ages 18 to 34) have surpassed Baby Boomers (ages 51 to 69) as the nation’s largest living generation, according to population estimates released by the U.S. Census Bureau. The Baby Boomer generation peaked at 78.8 million in 1999. The Millennial generation – which now numbers 83.1 million — continues to grow as young immigrants expand its ranks. So, what’s that demographic shift have to do with capitalism?